I don’t care what people are doing, and I don’t want people to know what I’m doing. I can understand the first reason, but it’s the second reason I take issue with. If you are the person who tells me you don’t care what other people are doing, and you also don’t want people to know what you’re doing, then you need to stop texting me everything you’re doing throughout the day! Stop texting me that you had the best burrito ever. Stop texting me that you found a great deal on shoes at Payless. Stop texting me how tired you are because you didn’t sleep well last night. Stop texting me to tell me you’re going to bed now. Stop texting me what your mom/dad/brother/sister just said to you. Stop texting me asking what I’m doing. These are all the sort of things Twitter was made for. You bash on the service, yet you do it on a smaller scale by individually texting all your friends the same message. Knock it off, and start Twittering! The new Voice Memos app on the iPhone 3.0 software is pretty cool. It makes great sounding recordings, and it’s easy as pie to use. The only glitch I’ve run into is that you can’t get the recordings off if they are over 2 minutes. Now what? There are two three methods. One is easy, one is for the geeks, and the third is an in between one. When you plug your iPhone into iTunes, go to the Music tab and make sure that there is a check mark next to “Include voice memos”. This will automatically sync your voice memos into their own playlist in iTunes where you can then do whatever you’d like with them. 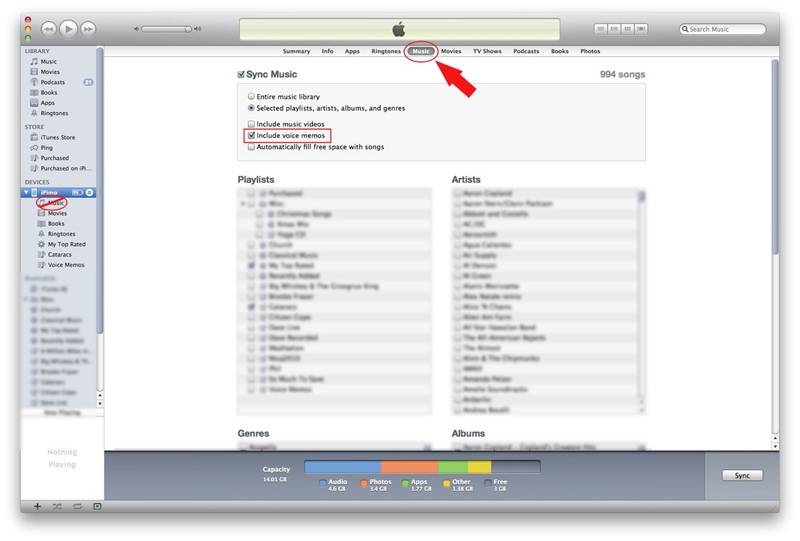 Here’s a screenshot of where to look in iTunes. If you have your iPhone jailbroken, you can SSH into it and pull the recordings off manually. They’ll play just fine in iTunes or QuickTime and then you can convert them to another format if you want. Version 2 is free, but version 3 has a demo mode that will allow you to transfer the memo for free. You can find both versions on the downloads page. Connect your iPhone via USB cable to your computer and open iExplorer. If this has helped you, I would greatly appreciate a dollar or two, but no pressure. Either way, thanks for reading! how amazingly far we’ve come with technology. However, sometimes I just want to wring someone’s neck for being lazy or not caring. I checked Borders for two items: a book by John Eldredge, and a Moleskine notebook. Both inventory reports for the Mission Viejo Borders said that it was “likely in store.” I reserved it online by putting in my name and email address, and the confirmation page told me to wait for an email within two hours to tell me if it was in stock or not. Well, I didn’t want to wait, and figured they would at least have one of the two in stock, so I drove down there. The books were in my hands, so clearly the system kinda broke down somewhere. Apparently the website sends an email to the store, which is then taken by an employee to hunt down the request. When they don’t find it, they notify the website that they don’t have it and then you are emailed. When I asked the checkout clerk what might have gone wrong with the system, she said that it probably just got put on the shelves right before I picked it off the shelf. That means that when the employee looked for it, it hadn’t been stocked yet. This doesn’t make any sense because the website said that the book was “likely in store” which would mean that the system had some sort of awareness that the book could possibly be there. My theory for what happened: Request landed in the hands of one of the lazy, coffee drinking, mohawked, minimum waged employees who wiped his nose with the paper, and then reported back that it wasn’t in stock so that he could go take another smoke break. He probably thought it wouldn’t matter because who would be stupid enough to go to the store when they told you they don’t have what you’re looking for? What he didn’t account for was my impatience… and maybe a little bit of my stupidity. I guess it bugs me because it could have caused me some inconvenience had I waited and trusted what they said. If they didn’t have it, then I probably would have had to drive to a farther bookstore which would have wasted my gas and time. Or I might have ordered it online which would mean that I have to wait till next week to get it. I know, I know, I shouldn’t complain because it’s pretty amazing that it’s possible for almost anyone to get their hands on virtually every written word in the world within a week. These huge stores provide vast amounts of learning possibilities and wisdom from millennia ago that would blow the minds exponentially of every reader going back thousands of years. It’s just a shame that forward progress can be halted by one lazy person. I’ve had a ton of spam links for drugs of various kinds showing up in my header and footer for a long time. I keep deleting them and they keep coming back. They aren’t visible, but they have caused Google to no longer list my site in results even when searching for my specific domain name. I finally hunted down the code that was causing the problem. I don’t claim to know everything about php or WordPress, but maybe my experience will help you. In my footer.php file, I found the code <?php do_action('get footer'); ?> at the bottom of the file just before the </body> tag. This seemed to be retrieving the spam links in the footer. I found some help on the WordPress forums, so I guess it’s a known problem. For those of you using Twitter for more than a couple weeks have no doubt received at least one email notifying you that someone new is following your updates. Some of you even know that these followers are usually someone you don’t know that just wants you to follow them back, even though they are just retweeting the good stuff that they get from other people. Well, I received the strangest and probably the scariest follower this morning. Apparently, this user only follows people who have the name “Alex” or “Casey” with the exception of some famous Twitterers like Kevin Rose and John McCain. The notification email sent to me said that “Cody Hutchison” was now following my updates. This user, who also goes by “footballguy166”, has what I can only describe as a fetish. He seems to be collecting a certain type of Twitterer, but not based on what they tweet. He’s following 365 people and hasn’t posted a single update, which makes me wonder what the heck is going on. It’s like a train wreck. I can’t NOT look and wonder what’s gonna happen. Do you have any weird followers or experiences on Twitter?